Young children worship at Emmaus Evangelical Lutheran Church in Racine, Wis.
As a mom of two little ones, I’ve discovered that every season of parenting brings a different need for the best place to sit in worship. In the early days, with my first child, I needed room for the car seat and sleeping baby, then access to the rocking chairs in back for nursing. Then we needed greater proximity to the bathroom for those “I-have-to-pee-now” trips with a potty-training toddler. When that toddler began to walk, I found it safer to sit in the middle of a pew to minimize all that running up and down the aisles. Then we had a second child, and the pew shuffling began again. At church, I know many people have a spot that is practically sacred to them. Yet as a mom worshiping with two young children, I’ve found value in not sitting in the same spot. Here’s what our family has learned. When I sit in front, my children get a chance to see the worship service up close. They watch the acolytes lighting the candles and see their intense expressions as they carry the offering plates and help set the table for communion. My children can see the Bible and the spot where members of the congregation come forward to read God’s word. They can feel the reader’s emotion and reverence for this sacred book. They witness how the table gets set for communion and how the pastor carefully places the wine and bread on the linens and the way she holds her hands. On the days we sit toward the back of the sanctuary, my children can see the behind-the-scenes work of the ushers: handing out bulletins, holding the door for people, helping people to their seats, giving a quick tutorial on the bulletin and hymnal, hanging up coats, and holding a fussy baby for a tired mama. Every place a family sits for worship provides a glimpse into the gift of being in community. Varying where we sit each week means we sit by different people. Some weeks we’ll plop ourselves down between two families, with our kids on each side of us so they can share toys and snacks. Other Sundays we’ll sit by a group of older women who share their bulletins for coloring and open their laps for sitting. My children also get to see me model what it means to be in community: sharing the peace, saying hello, offering a hand to help someone up and down. Every Sunday we get a chance to witness the diversity and beauty found in the body of Christ. Some people have their specific pew where they’ve spent years worshiping, and when they move away or die their absence is noticed. I can help my children understand that even though we can’t see the faces of those no longer with us, we can still be with them in worship. When a widow comes to worship and sits without her spouse, I can give thanks with my children for a life devoted to God and remind them that we are always part of one another through the communion of saints. 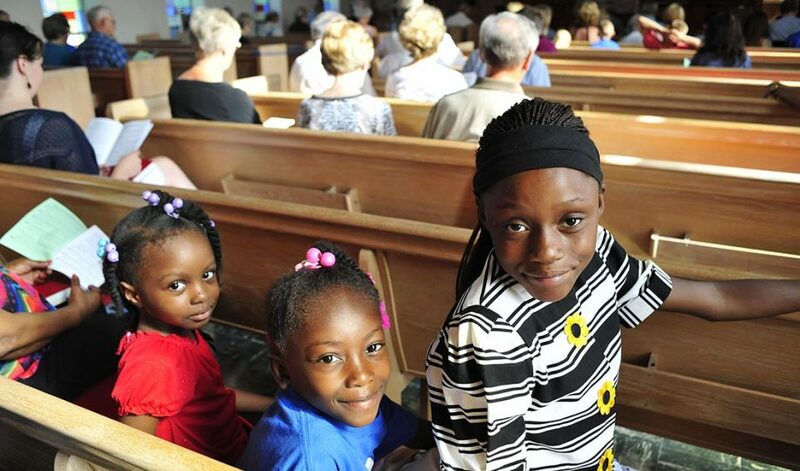 On some Sundays—those days when just getting inside the church doors is an accomplishment—I simply walk to a pew, and a member of the community, seeing my look of exhaustion, takes my children and offers them a seat. No questions asked, only love and welcome. In that moment I give thanks for the many pews and the people I’ve met in them along the way.